Visitors’ numbers to Rottnest Island are increasing, with last year being a record with nearly 665,000 visitors. December and January saw a 16 per cent increase compared to the previous year and I have no doubt that is due to ferry competition and reduced ticket prices to go to Rotto. Since Sealink became a Rottnest ferry operator the Rottnest Express have slashed their prices and now run hourly morning ferries to the holiday island. Sealink offers free children fares, so that is all good for those who complained in the past that ferry fares were ridiculously high. From SEALINK the new kids on the block of Rottnest Island ferry services comes this special offer. 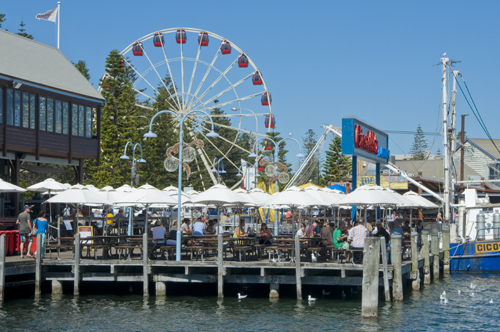 Depart Fremantle after 12pm and pay $29 for a same day return ferry and Kids travel FREE. We have an 8:05pm departure to take you back home. What are you waiting for? You don’t have to go far in Fremantle to feel you are on holiday, as I again discovered at the North Fremantle foreshore this morning. It is the kind of morning normal people refer to as bloody cold, and only those eternally optimistic glass is half full people call it invigorating, so I decided a change in routine would be good, after the routinely morning coffee and newspaper in a West End cafe, and had a stroll along the north bank of the Swan river. There were quite a few people out and about walking dogs and the only negative up that way is the constant noise of cars on the bridges. Here some impressions. Enjoy the long weekend! I did a tour of the cruise ship Sea Princess in Fremantle port today and came away mighty impressed. It is big, majestic and elegant, to the point where it almost overwhelmed. It’s 261 metres long, has 14 decks, bars, restaurants, a casino, gymnasium, library, spa, swimming pool, movie and entertainment theatres, etc. and accommodates 2000 passengers, who can get 24-hour room service. Sea Princess passengers consume 40 tonnes of food and drink per week; 10,000 bottles of wine and champagne, etc. The vessel was fully booked when it left Fremantle at 5 today for a four-week cruise, and that included over 150 children from the age of 3 upward. Princess Cruise Vice President Stuart Allison told the media pack that the cruise industry is growing fast and expected to have a million passengers a year by 2016, and that Western Australia is the state that cruises most. He said there was an overwhelming demand for cruises and that they will run all year from Fremantle next year. This will tripple the number of passengers sailing from W.A. and inject $30 million into the local economy. Next year the cruise line will carry more than 45,000 passengers to and from Fremantle between April 2015 and March 2016 on 25 cruises. It is all very positive for Princess Cruises and the W.A. economy and I am sure the pampering one will experience during a cruise will be fantastic. Today we only met extremely friendly staff who all smiled and said hello and they are from all over the world. Our lunch was delightful. The lobster tail as entree and duck breast on red cabbage for mains was yummy, to be followed by the biggest vanilla slice I have ever seen. One observation though. Why market the cruises as Meaningful Traveller when passengers don’t really do anything meaningful on the trip. It is not as if in every harbour there is a fundraising event to support a local charity, or help build a school, or that passengers deeply and meaningfully engage with the local culture and people of the countries they visit. No doubt a cruise is one of the safest and most comfortable ways to spend a holiday, especially for the older and less adventurous among us, but meaningful? There is no need to use spin when one has got an outstanding product, and Princess Cruises do have that.